Many months ago I wrote an article title that demonstrated the use of DataList and DataGrid controls to create master detail pages. ASP.NET 2.0 introduced GridView control supersedes the older DataGrid control and adds many enhancements. In this article I am going to show how master detail pages can be developed using GridView control and SQL Data Source control. In order to begin developing our sample you need to create a new ASP.NET web site in Visual Studio. Also, ensure that you have access to Northwind database of SQL Server 2005. Now drag and drop an SQL data source control on the default web form. Configure it to select CustomerID, CompanyName, ContactName and Country columns from the Customers table of Northwind database. Next, drag and drop a GridView control on the web form. Set its DataSourceID property to SqlDataSource1 (the one that we just configures) and DataKeyNames property to CustomerID. 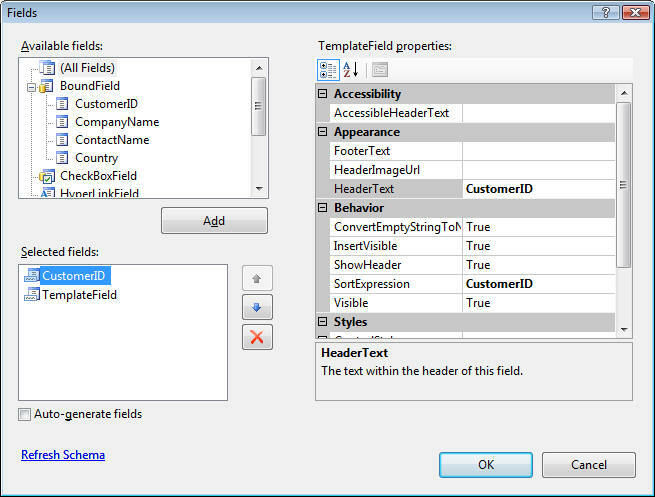 Add two TemplateField columns to the GridView. The second template field consists of a Button control. Set Text property of the Button control to Show and CommandText property to Show. We will use the CommandText property later in our code. 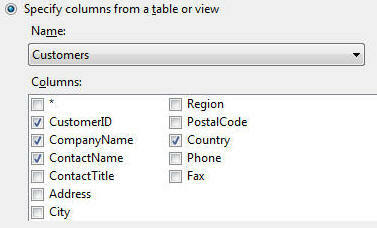 The ItemTemplate region consists of two Label controls, one GridView control and one SQL data source control. 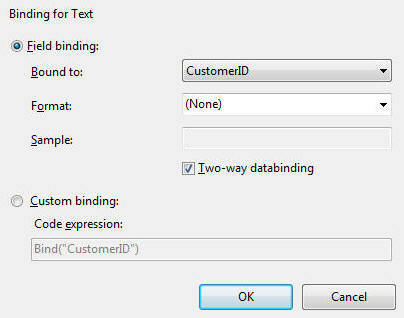 Open the data bindings editor of the first Label control and bind its Text property with CustomerID column. Similarly bind the Text property of other label to CompanyName column. Notice the SELECT query carefully. We fetch all orders from Orders table for a specific CustomerID. It contains a parameter @CustoemrID that we will be supplying via code. Set the parameter source for this parameter to None in the final dialog of the SDS configuration wizard. This completes configuration of the second SDS. Set their HeaderText property to Customer ID, Company Name and Contact Name respectively. Similarly, set their DataField property to CustomerID, CompanyName and ContactName respectively. This completes the design part of our sample. Let's add some code that makes our sample live. 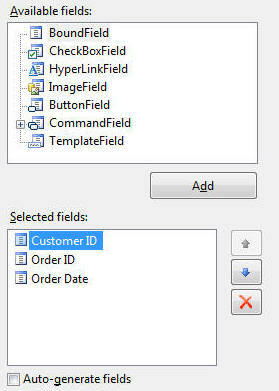 Recollect that we have added a template field to the parent GridView that contains a Button control. Later in our code we need to somehow identify that Button from which row was clicked by the user. We achieve this by setting CommandArgument property of the Button from each row to the row number. To set this property we need to handle RowDataBound event of the GridView. The RowDataBound event is raised when each and every row of the GridView including header and footer is data bound. The following piece of code shows the RowDataBound event handler of the GridView. The code declares a class level variable called index that keeps counter of row number. The RowDataBound event handler first checks the RowType of the row being data bound. This way we execute our code only for rows and not for header and footer. We get hold of the button from each row using FindControl method of second row cell (indexing starts from zero). We then set CommandArgument property of the button to the row index. The code checks the CommandName property of GridViewCommandEventArgs object supplied to the event handler. This property will be Show when user clicks on the Show button. The code then retrieves reference to the button that was clicked. 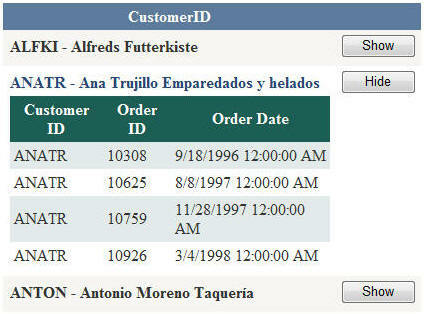 If the Text property of the button reads Show we retrieve CustomerID for that row from DataKeys collection. 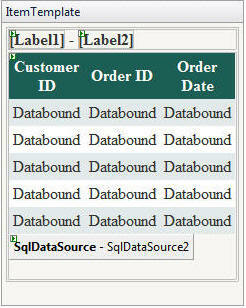 The @CustomerID parameter of SQL data source control is then supplied. Then the Visible property of details GridView is set to true. Finally, Text property of the Button is changed to Hide. The code in the "else" block simply hides the detail GridView and sets the Text property of Button to Show. Notice that you can hide or show the detail grid for individual master rows. This is handy and often desired if your master grid contains many records.